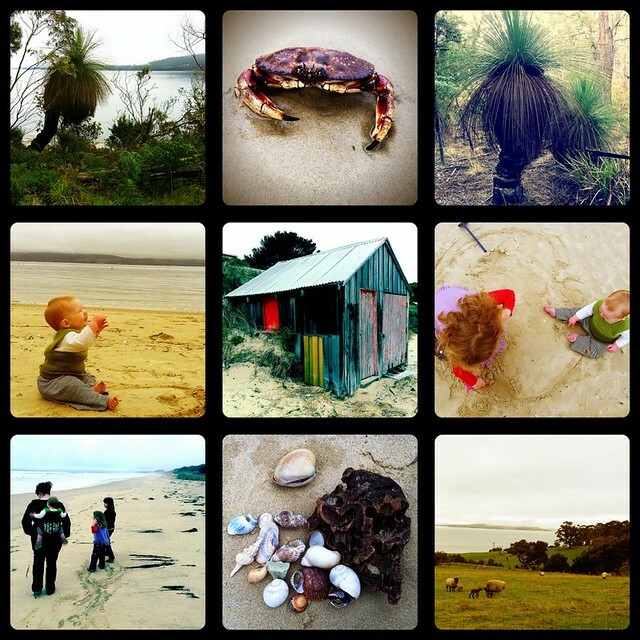 Our second full day of our adventure was spent on the northern part of Bruny Island. The north and south are separated by an isthmus that happens also to house a penguin rookery. The north is full of beautiful beaches and bush and to our surprise, Xanthorrhoea australis. Grass trees. Huz and I love them so much, one of our owlets' names is derived from the latin name. So sculptural and amazing and at this size, very old... We spent some time rolling around on Nebraska beach, picking up shells, admiring beach houses, chatting to crabs... Then spotting newborn lambs and penguin footprints on the way back to our shack. Whereupon we all had a nap and an earlyish night. Today I woke feeling renewed. Time away always gives me some fresh perspective. I think we'll need to do this every now and then when we feel in a rut... And so, for once, I'm actually looking forward to Monday. How about you? PS. Huz has vlogged the trip too! See it here.